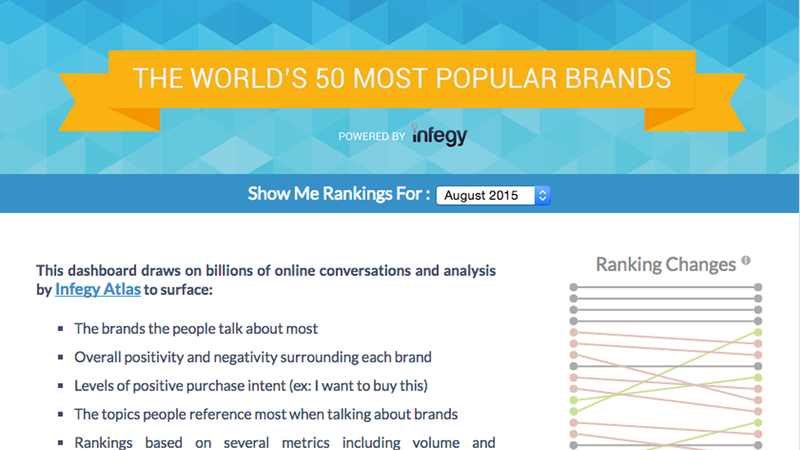 Kansas City based Infegy has opened up a page tracking the top 50 social brands across the whole internet. In fact, you can see the top brands by year going back to 2009, or by month so far in 2015. The list was created through analysis of total conversations, brand sentiment and purchase intent. Rion Martin, Director of Marketing at Infegy, said "the report analyzed more than 800 brands worldwide and drew on millions of online conversations." From the tech point of view, there were 24 tech brands in the Top 50 and 16 were online brands which is where all the conversation is happening. A notable that raised our nerdy brows was Soundcloud at number 11 beating out YouTube at number 13. The dashboard shows not only rank but gender conversation and sentiment by gender, purchase intent and the monthly trend. We interview Rion about the report and some of the things that their social analysis engine has discovered. Check it out! For example, in May 2015, when top FIFA officials were arrested, online chatter around the brand spiked 33 spots within the top 50, even though positive sentiment declined. As of August 2015, LG broke into the top 50 at No. 29 with the news around the Nexus 5 and mentions of a new smartwatch. Further, NASA rose 26 spots to No. 20 in July in regards to New Horizon’s flyby of Pluto. The top four brands have remained unchanged since 2012 – Google, Twitter, Apple and Facebook, in that order. In fact, Google has been the top brand since 2009, except in 2010 when Apple knocked it down to the second position. The report reveals the power of celebrities in boosting a brand. In August 2015, Ferrari moved up 16 spots, driven by four big names: rapper Tyga, who bought a Ferrari for his girlfriend’s birthday, reality star Kylie Jenner; Christian Bale, who will play Enzo Ferrari in an upcoming film; and Ferrari F1 driver Sebastian Vettel, whose blown tire cost him third place in the Belgian Grand Prix. 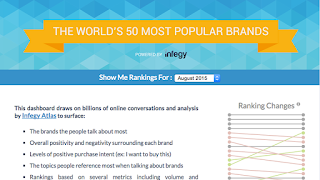 New products, particularly tech devices, also boost online conversations about brands. Buzz around a new smartphone and smartwatch brought LG into the Top 50 in August 2015, skyrocketing to No. 29 after leaked photos of the upcoming Nexus 5 and mentions of a new smartwatch emerged online. Not sure if the Apple conversation will move up Apple but it will be interesting to see the September data. The report also includes demographics information, showcasing the difference between the brands men and women discuss the most. In August, MetLife, made the list for the first time ever with the highest number of female gender distribution (78 percent), after One Direction’s Louis Tomlinson thanked fans for a great night at MetLife Stadium in a tweet. At the same time, the top brands discussed by males were the NFL, MLB and NBA.